Growing up in a family of artists taught me to appreciate the handmade object. I value the beauty of simplicity, the integrity of form and the richness of decoration. I attempt to instill each of these qualities into my work and hence into my daily life. By making pottery that is honest and true to myself I hope to share with others the beauty and insight clay brings to my life. My intent is to make useful objects that challenge the familiar. I strive to make well-crafted pottery that records the transformation of material and process. 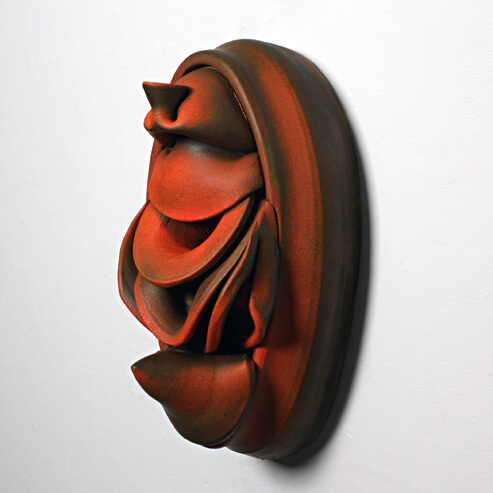 I use volumetric forms that suggest sensuality in the curves and bends of the clay. Soft celadon glazes highlight the decorative marks that pattern the rich surfaces of my pots. Within this body of work I bring together influences as diverse as woven crafts, antique glass, and the Art Deco period. These influences combine to reveal the decorative language in the details of each piece. My process begins at the wheel, making heavy alterations while the work is wet and malleable. I use white stoneware clay that is intended to capture the brilliance of the transparent glazes. The surfaces of my pots are adorned with decoration, textured using a variety of techniques such as slip trailing, carving, and stamping. My functional ware is then glaze fired to 2232 degrees in an oxidized atmosphere.